Stop carrying on paper blocks or anything else inside the pockets. Here the user is able to insert skateparks and spots at any time, in addition to photos and videos, thanks to an intuitive graphical interface and allows the user to easily find everything you want to accomplish with this tool. No more talk! Adds his entire crew and begin to spread out and give the best spots in the world in the palm of your hands. 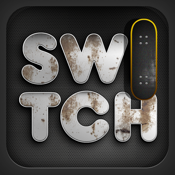 The Switch Skate Guide is the most complete spot guide that works better in the palm of your hands.